As the clock inevitably counts down towards everyone’s favourite time of the year, those fantastic beings who make Christmas so magical are already hard at work with preparations for the festive season. Santa will be dusting off his sleigh, giving it the annual MOT, the elves will be ramping up production of toys and gifts, and eggnog suppliers will be hoping their crops of nog will be ready for harvest time. Then, of course, there’s the reindeer, who will be limbering up for their mammoth marathon across the globe on Christmas Eve. If you’re near the north pole, you might even be lucky enough to see herds of reindeer on one of their infamous training routes, pushing themselves to their limits, hoping to be selected for the squad. Unfortunately, one reindeer seems to have gone a little off course, and run into some treacherously deep mud. As the video shows, the reindeer rescuers literally saved Christmas. Which is not something to be underestimated. The reindeer knows this too, as at the end of the video it looks backs and seemingly acknowledges the efforts of the two men. Perhaps the two men were Christmas elves themselves, and were acting as spotters for the training reindeer. Whoever they are, it’s good to know there are always people around to help you out when you get stuck in a rut. I’m assuming the rest of the running reindeer continued on their journey, unaware that one of their mates had fallen into some sticky times, which is why two men had to help it out. 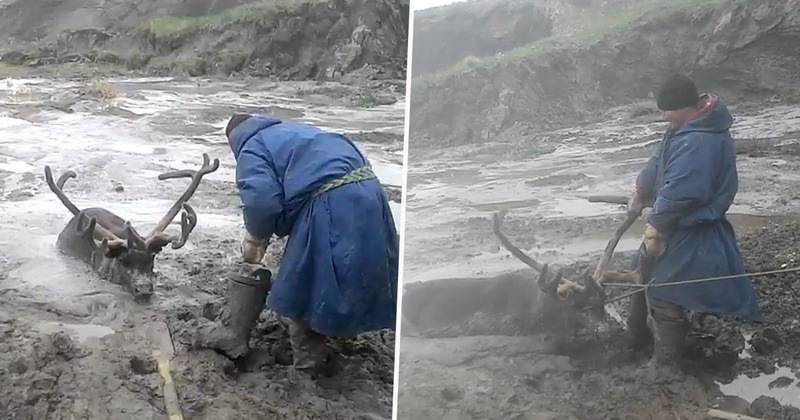 If other reindeer had been around, however, I’m sure their rescue would’ve looked something like this one, in which three adult elephants rushed to help a struggling calf cross a river. The helpless youngster had been trying to cross the flowing river, but ended up being washed downstream. Luckily, the older animals were on hand to help out. The fully grown elephants in the video were obviously large enough to handle the ranging waters of the river, but the little calf had a harder time. The baby Asian elephant had been following its mum and the rest of its herd across the muddy Manlao River when the torrent became too much for it to handle. It was almost swept away, out of the camera’s view, as the murky water overpowered it. The footage was captured earlier this month by wildlife observers as the herd moved across the river in the town of Kangping, which is in Jiangcheng Hani and Yi autonomous county in south-western China’s Yunnan province. The three older, wiser elephants worked together to block the calf from the flowing water. The mother elephant was then able to catch the young’un before it was swept any further away. The group huddled together and swiftly moved towards the riverbank on the other side until the members of the herd were safely in the long grass at the side of the water.